Variable clouds with showers at times, and perhaps a rumble or two of thunder, especially this evening. Low 59F. Winds light and variable. Chance of rain 40%. Head coach Edwin Thompson takes part in the event by washing a child’s feet in Alumni Coliseum on Jan. 21. On Martin Luther King Jr. Day, people across the United States can be found in their communities doing service projects in honor of the famed civil rights activist. Some of those activities might be picking up trash, giving food to people without homes, or for the EKU baseball team, washing the feet of children. On Monday in Alumni Coliseum, the EKU baseball team, led by head coach Edwin Thompson, served 275 children in the Madison County community by washing their feet and giving them a new pair of socks and shoes. For the third year in a row, Thompson and the EKU baseball team have partnered with Samaritan’s Feet, a non-profit organization whose mission is to provide shoes for disadvantaged children. Samaritan’s Feet is a Christian-based organization that holds different events like volunteering to wash feet, shoe drives and mission trips to provide shoes and encouragement to children. Each volunteer has a different job, whether they are washing feet, finding the right size of shoe for the child, helping them write down their dreams or playing basketball after they get their shoes. During this event, the families were also given a free lunch, provided by Chick-fil-A. Denise Blomberg, Samaritan’s Feet regional director of operations, said for those fortunate enough to never worry about having shoes, this event can be eye-opening. It forces people to get out of their comfort zones, she said, and the impact on the kids is always evident. One of the student-athletes who got to witness that was Jacob Abbott, junior infielder from Lexington. As part of the event, coaches across the United States coach games barefoot. According to Samaritan’s Feet’s website, 3,000 coaches over the past 11 years from all levels have participated. Blomberg said that out of the 3,000 coaches, Thompson is the only baseball coach to ever participate. In their game against Tennessee Tech on May 4, Thompson will coach barefoot in support of the organization. 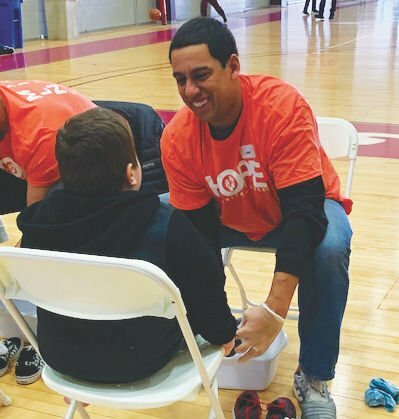 For student-athletes who are provided with many resources, like shoes, shorts and sweatshirts, this event allows them to have an opportunity to serve kids who look up to them and put life into perspective for a day. Thompson said one of his goals for the program is for his athletes to impact their community and to be able to see that impact firsthand. Of all the events, this is the one that seems to impact the student-athletes the most, he said. “Richmond is a special place, just because of what the school does and what Coach Thompson does to give back to the community and the area,” Blomberg said.